IN 1954, fresh from the Korean War, the United States Navy's USS Tarawa paid a courtesy visit to the nation's capital, complete with at least five units aboard. Well known aviation historian Ron Brazier was there with his camera and captured the following impressive scenes from a suitable vantage point above the carrier's wooden decks. MOUNT COOK Airline, and to a lesser extent Air Nelson, continue to be seen as a lucrative prize by order-starved airliner manufacturers. The fact that these airlines recently sent a high-ranking technical team on a three-week tour of the potential producers of a replacement for the HS748/Saab 340 has no doubt fuelled the fires. Mt Cook have been wooed with the BAe ATP (1991), ATR-42(1992), Canadair RV(1993) and the DHC-8-400 earlier this year, while a Saab 2000 demonstration is rumoured to be just around the corner. It was therefore no great surprise to find an ATR-72 scheduled for demonstration during June. 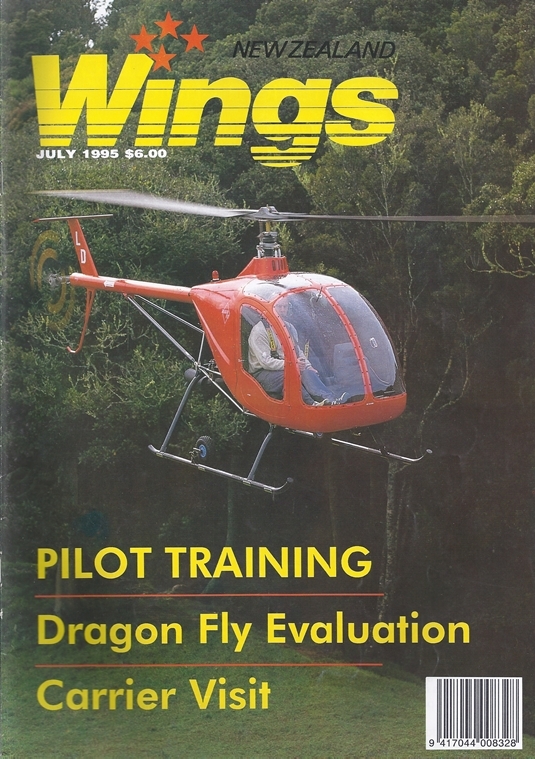 I WAS quite interested when I received Ross' invitation to fly Barry Payne's Dragon Fly Model 333 and more than a little apprehensive, as it is some years since I had operated a small helicopter and I felt less than adequately qualified to technically evaluate this one. Nevertheless, I tried to view it from the perspective of a trainee pilot as the Italian designed machine appeared ideally suited to the training role; potentially the future Cessna 152 of helicopters. From Helicopter Training College: Brian Webb (R22 ZK-HDF) And Elvie Williams (R44 ZK-HJD) Show The Lines Of Some Of The Helicopter Training College Robinson Fleet Over Whitford, Not Far From Their Ardmore Base. John King Photography.